Argus Heating design, manufacture, and distribute a wide range of IBC and drum heaters. Drum base heaters are specifically designed to reduce the viscosity of products or melt solids to a pourable temperature. 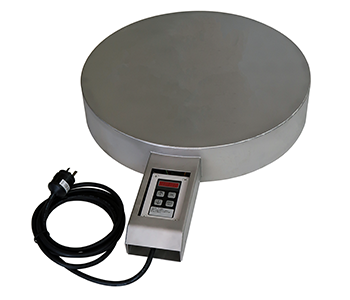 The digital controller will maintain the required product temperature. If rapid heat up is required, and the contents will accept an additional heat source, a drum heating jacket, flexible silicone drum heater, or drum insulated jacket, can be used in conjunction with the metal drum base heater. ‍550mm diameter base. Weight: 15kg. Two-metre power cable with moulded 3-pin plug. ‍Rugged stainless steel, reliable silicone heater mat, and high density Rockwool insulation. Drum base heaters are designed to reduce the viscosity of products or melt solids to a temperature at which they can be poured. They can also be used with heated jackets.